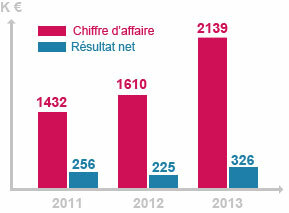 Our profit and loss account for 2013 attained a new level with turnover up 30% from 2012. Thanks to strict management of our operating costs, our margins have progressed in a similar proportion. Such an outcome allows us to make new investments to build up our capacities and further broaden our range of services. In our next newsletter we will have the opportunity to tell you more about these future developments.